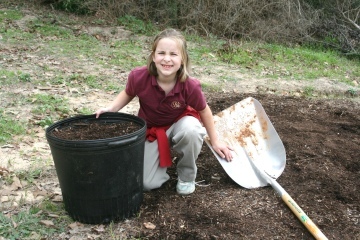 Regents Academy received a $500 grant from Keep Nacogdoches Beautiful to build two above ground flower beds on campus. 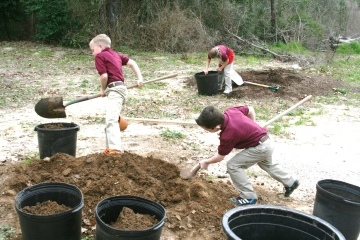 Mrs. Lori Cunyus helped the school get the grant and is preparing to plant beautiful spring flowers in them. 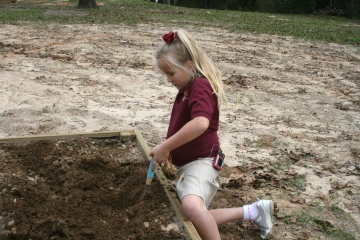 Her second grade class helped till the soil and get ready for planting. Dirty hands. Tired back. Fresh soil. School is in session. 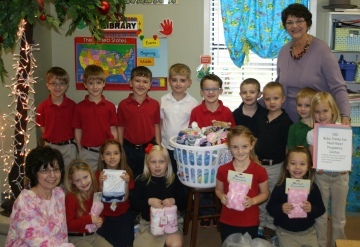 Each year the Kindergarten class celebrates their 100th day of school by collecting supplies for Heartbeat Pregnancy Center in Nacogdoches. This year the kindergarteners, with the help of the Regents students and families, collected more than 100 receiving blankets and baby booties to donate to our friends at Heartbeat. Pictured below is the class with their teacher LaWanna Smith, along with Mrs. Dee Still, the director of Heartbeat. 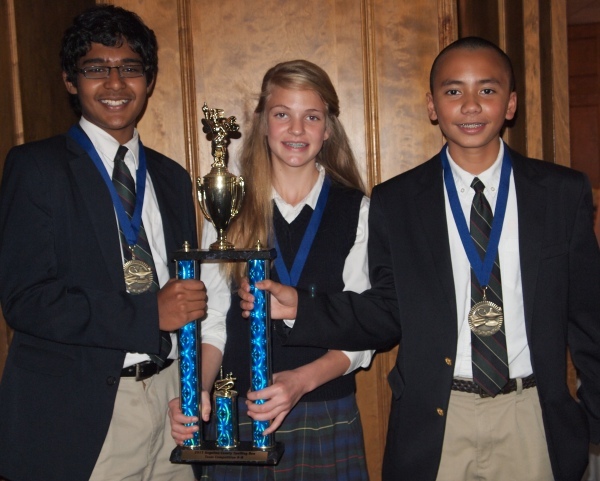 Two Regents Academy teams won First Place in their division competitions at the Spelling Been in Lufkin, Texas, on February 2, 2013. The Spelling Bee is sponsored by the Kiwanis Club. 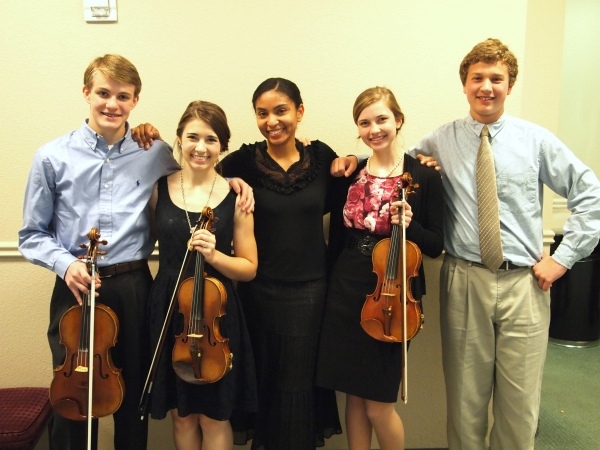 Pictured below are the winning students at the luncheon that was held in their honor on February 6. 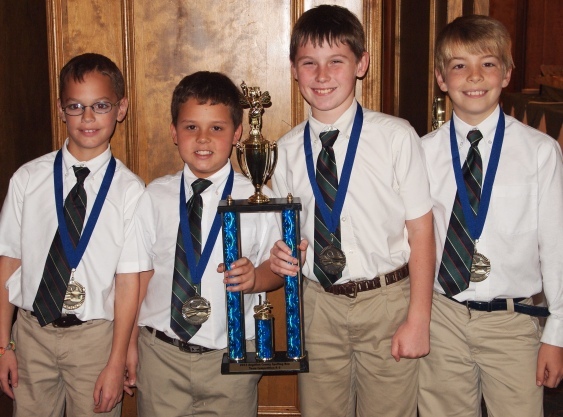 In the top picture is the 5th grade team: Ethan Fairley, Gavin Griner, Connor Young, and Zane Anderson, who won the 2nd through 5th grade competition. Pictured below is the Regents 8th grade team: Haafiz Hashim, Sarah Grace Alders, and Colton Willhite, who won the 6th through 8th grade competition. What does it mean for an education to be Christian? What makes a school a Christian school? Answering these questions requires more space than I have here (in fact, very good books have been written to answer this question!). But here is an attempt at a brief and digestible answer that I hope is helpful to you. As Creator and Sustainer of the universe, God has not only established all facts, but also the meaning of all facts. All truth is God’s truth. The goal of true education is to find the true relationship between both God and man and God and all of the particular details of the universe. To be known truly, all subjects must be studied in the light of God’s Word. All truth is ultimately religious, and all education must be conducted in light of God’s perspective on the subject. To assume that any area of knowledge can be known truly apart from God’s revelation of Himself is to undermine the foundations of all knowledge . . . to attempt to understand the universe apart from Scripture will naturally lead many to fail to comprehend reality. Therefore, for an education to be Christian, it begins and ends with the existence, character, and Word of God, with Christ at the center. This does not mean that Bible verses are tacked on wherever we can make them stick, but instead we see that history is God’s story of the world, that math is (as Galileo famously said) “the language with which God has written the universe,” that language is the words God has given us with which to communicate, that science is the systematic study of God’s world, and so on. Every subject is united into one grand unity of truth in the One in whom Paul says is hidden all the treasures of wisdom and knowledge (Col 2:3). And second, a Christian education is Christian because of its distinct method. A Christian school is more than a neutral, blank canvas with school rooms, books, students – and Christian teachers added in. A Christian school has a distinct method of discipling students that is based on a biblical and Christian worldview. An important part of any education in a public setting is order. A teacher cannot teach if students are lighting fires in the wastebasket, shouting over the teacher, and stealing answers from each other on tests. That’s why education students learn classroom management in college. But a Christian school is concerned with much more than classroom management. If our concern is educating the whole person, we desire not just to teach minds, but we want to shepherd hearts. Discipleship must be the driving force of a teacher’s interactions with her students. It is important that a student remains quiet while others are speaking so that he can hear him, but it is more important that he learns to love his neighbor as himself. If he does love his neighbor, he will want to hear what his neighbor has to say. God commanded Israel, “You shall love the Lord your God with all your heart, with all your soul, and with all your strength. And these words which I command you today shall be in your heart” (Deut. 6:5-6). God’s instruction for his people was not merely that they offer him external obedience. He wanted their love. Behind His laws for their behavior was His desire for their heart. He wanted them to love Him with every part of their being, and He wanted His words to inhabit their hearts. If Christian parents and educators are to follow God and disciple as He does, they must aim for the heart. Jesus taught that true obedience to God is obedience from the heart. Christian schools have as their goal to be like Jesus, so they aim to disciple like He did. Christian schools don’t simply make laws for the students and the classroom and enforce them with an iron fist. Rather, like Jesus, they teach their students to obey from the heart and train them to love the Law of the Lord. 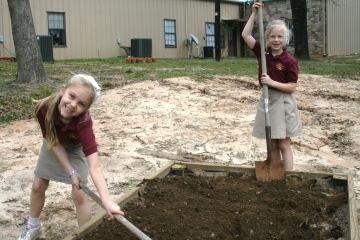 Discipling students with grace and love: this is the educational method of a Christian school. “What is the difference about a Christian school and the neighborhood public school?” Simply put, everything. Regents Academy is a Christian school. We make no apologies about it. But what does it mean to be a Christian school? “Christian” is a description that seems to be applied to just about anything: stores, music, online dating services, you name it. But what about a Christian school? What does it mean to place the word “Christian” before “school”? Maybe it will be clearer if we begin by saying what a Christian school is NOT. First, to be a Christian school does not mean simply that we have Christian teachers and prayer in our classrooms. Every truly Christian school has Christian teachers and prayers, but non-Christian schools can have them also – and can still be non-Christian schools. To be a Christian school does not mean simply that we have Bible classes. Again, Christian schools teach the Bible. But if we are just adding Bible classes to a curriculum that is not that much different from what is found in a non-Christian school, then what we have is a non-Christian school with Bible classes. To be a Christian school does not mean simply that we are withdrawing from the world. Some parents are drawn to a Christian school because they believe that the school is a safe place that is insulated from much of the ugliness in our culture. And yes, a Christian school is a safe haven, but it must be much more than a retreatist institution. Finally, to be a Christian school does not mean simply that we have stringent moral standards. Yes, we believe that lying, cheating, and stealing are sins against a Holy God and must be called such and then dealt with in Christian love and with biblical principles. Yes, we believe that etiquette and respect are Christian graces, and we require our students to display them. But a Christian school is so much more than a set of moral standards. The theological word for producing morals without a changed life is legalism. A Christian school is by definition a grace school, not a legalistic school. So then, we are still left with the question: what is a Christian school? I offered some thoughts on what a Christian school is not. Next week, I will offer some thoughts on what a Christian school really is. The Nacogdoches Fire Department is sponsoring a wonderful program for our county’s 5th graders, and the Regents 5th grade class is excited about participating. The 5th grader who reads the most by the end of March will win first prize. First prize is being picked up in a firetruck and driven to school while being fed breakfast by the firemen! The second prize winner receives a prize basket. 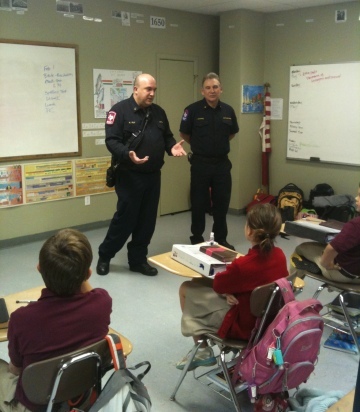 Pictured below are Captain Michael Self and Chief Joseph Ramirez, who introduced the 5th grade class to the program. Thank you, Nacogdoches Fire Department!